-Mother of St. Augustine of Hippo. - Patroness of Conversion of family members. - Feast Day: August 27th. 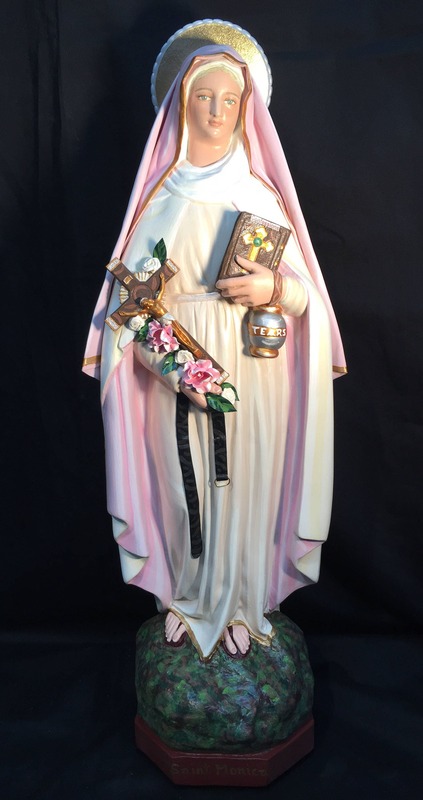 This 18" statue features a magnificent hand painted face and details such as fingernails and eyelashes, and golden halo. St. Monica holds her son Augustine’s book of ‘Confessions’ in one hand, with an earthen jar of her tears. 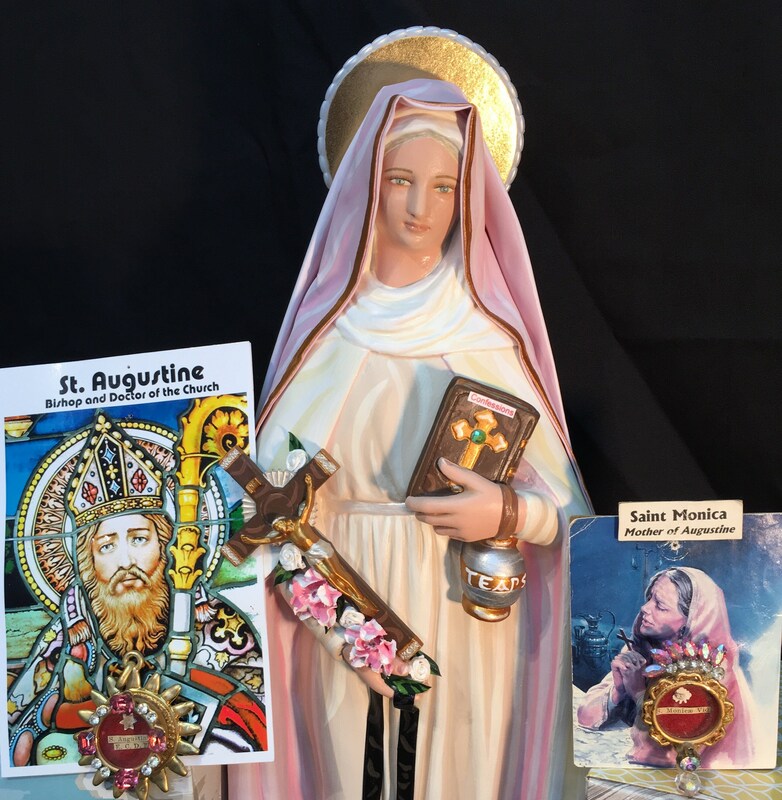 Her other hand holds a flowered crucifix and the prophetic belt of the future Augustinian habit. 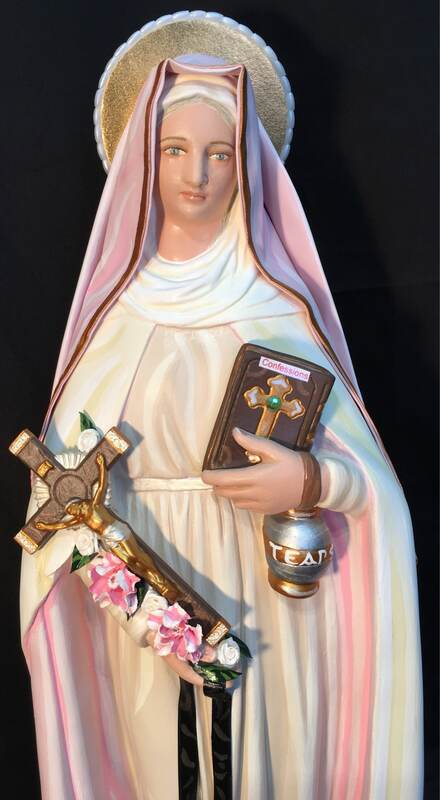 This statue will also be touched to a first class relic of St. Monica (as shown in photo). Note: All our statues are made to order and handmade in the USA. Please allow 5-9 weeks for us to make an ship your statue. What Sets Heavenly Saints Statues Apart? • TECHNIQUE - Hand painted with fine brushes and artist pencils for sharp lines of demarcation, not air brushed with blurred overlapping colors. • FACES - Not afraid to show close-up highly detailed photos of tour statues faces. Proprietary painting and finishing techniques in producing stunning life-like faces and eyes. • ADORNMENT -Hand makes all of its adornments such as tiny rosary beads, cloth veils, golden halos, flowers, cloth cloaks and more for its statues as appropriate. • IMPRINTS - Feast and name of statue imprinted on the base . Veneration includes remembering and honoring the feast day. • WORKSHOP - Not mass produced or imported from China, South Korea or Hong Kong. All statues individually hand crafted, painted and adorned in-house at the time of order by our own artisans. • EXCLUSIVE - Available only through us, not catalogs or stores. • FINISHES - Protected and enhanced with several layers of matte and sating clear coats. • PRODUCTION - Cast and embellished on site with sculpting clay and hi-grade plaster. • FOCUS - Heavenly Saints only makes religious statues - you’ll never see birdbaths, buddahs, gargoyles, gnomes, fountains, etc. • INSPIRATION - Statues made during conditions of prayer and fasting in workshop in midst of 750 first class saint relics. So perfect. Great communication from the seller. Packaged very carefully. I will be recommending this shop to anyone looking for items like this beautiful statue. I cannot wait to give it to my mother! I received my St. Monica statue today and she is beautiful...just as it says! I cannot wait to give her as a gift! The receiver is very devoted to St. Monica and will love her!